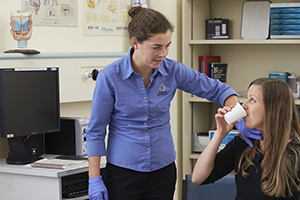 Speech Pathology provide assessment, diagnosis and management of swallowing and communication disorders for all inpatients and adult outpatients in the Fremantle Hospital catchment area. We also provide services to patients (within the South Metropolitan Health Service area) with Parkinson’s disease. Inpatient referrals are accepted from medical, nursing and allied health professionals by phone, e-referral, fax (ext 12924) or ward pager. Outpatient referrals are accepted from GPs and consultants. We offer clinical placements for Speech Pathology students at Curtin University and Edith Cowan University. Internal clinical development and continuing education is provided by the department.